Well, this pot has been bubbling for a while, and now it’s finally come to the boil. 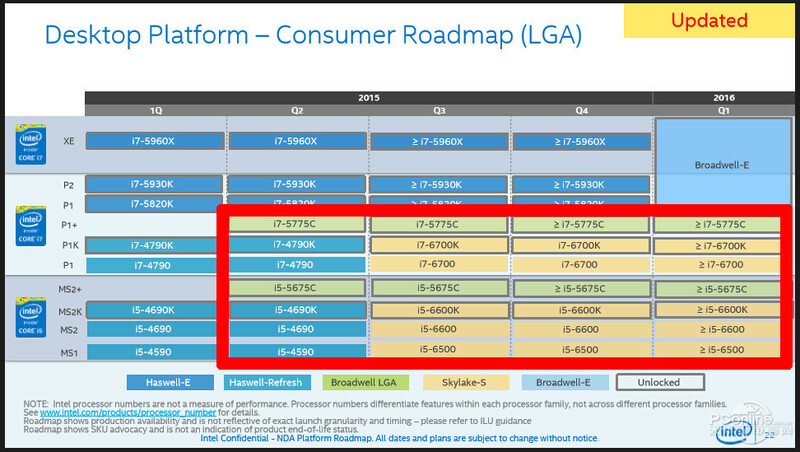 We have confirmation regarding the Intel Skylake-S Processors and their specifications. The first two up on our proverbial chopping block are the Core i7-6700K and Core i5-6600K, which were leaked a few days ago as the “Enthusiast” 95W processors. Let’s start with the i7-6700K, as it’s very much the flagship CPU. Here, we have a quad core design, with eight threads which of course means multi threading. The clock speed are at 4.0 GHz for the base and 4.2 GHz for the boost clock, with 8 MB of L3 cache. Ah, but what about memory support, I hear you ask? It supports DDR4 2133 MHz memory and DDR3L 1600 MHz memory. Moving onto the i5-6600K, it’s slightly more toned down than it’s brethren but not bad still. It still offers quad core, naturally, but unfortunately there is no multi threading on display here. The cache is slightly smaller, too, weighing in at 6MB of L3 cache. As you would expect with our current theme, the clock speed is lower with a base of 3.5 GHz and a boost of 3.9 GHz. Next up, are the so called “Mainstream” 65W processors. Here, we have four chips for our examination, including the i7-6700, which actually has the same specs as our friend the 6700K but doesn’t come in an unlocked package. Basically, it can’t be overclocked by the multiplier, where as the 6700K can be. As you might guess, the same story applies to the i5-6600, which has the same specs as it’s 6600K counterpart but without the overclocking. There is more to tell with the clock speeds, though, as the i7-6700 has 3.4 GHz as a base and 4.0 GHz as a boost. It’s brother in Mainstream, the i5-6600, doesn’t fare too much worse, though, with a base clock of 3.3 GHz and 3.9GHz boost. What about the i5-6500 and i5-6400, though? The 6500 is a quad core with 3.2 GHz as a base and 3.6 GHz boost, whilst the 6400 is also a quad, but with 2.7 GHz base and 3.3 boost. Naturally, we will finish off with our low power offerings from Intel, otherwise known as “Low TDP”. Intel will be releasing four of these low power chips, and all of them have just 35W to their name. This range will include the i7-6700T, which is a quad core with multi threading. It features a base of 2.8 GHz and boost clock of 3.6 GHz, as well as a rather nice 8MB of L3 cache, which is the same found in say, the Haswell i7-4700K. The other models, (Core i5-6600T, Core i5-6500T and Core i5-6400T) naturally have varying specifications, with speeds varying from 2.8GHz to 3.6 GHz. More information, and more detail, can be found in our lovely chart just below. Tagged with confirmed, cpu, details, Gaming News, intel, Skylake, skylake-s, Specifications, specs.